Introducing the Wouxun KG-UV899, Dual Band excitement, Mono Band pricing! The KG-UV899 operates at 4W. It features over 100 programmable memory channels compatible with both simplex and repeater pairs. Standard repeater tones are also available (CTCSS / PL) and you can set the frequency shift for + or - to either than standard 600Hz / 5kHz or set your own, perfect for working with odd splits. The KG-UV899 also has dual watch. With dual watch you can monitor a calling frequency while listening for activity on your favourite repeater. When the radio detects a signal it will allow you to hear the full transmission before going back to dual watch. Don't let the low price fool you. The KG-UV899 is packed with all the features you would expect to find in a ham radio. Channel Name edit and display, Dual Standby, 76-108Mhz FM radio, DTMF encoding, low voltage warning, voice prompt. The KG-UV899 is powered by 7.4v 1300mAh Li-Ion battery pack for reliable operation. Power saver mode helps increase efficiency and preserve battery life, great for when working public service events. High and capacity batteries are also available for when additional run time is required. The Wouxun KG-UV-899 comes standard with a one year Wouxun Warranty, which is administered in Canada by Fleetwood Digital when you purchase from us. Other dealers will give you a 30 day return, and then after that your on your own. NOT AT FLEETWOOD! We look after you for the entire duration of the warranty period, ONE FULL YEAR. 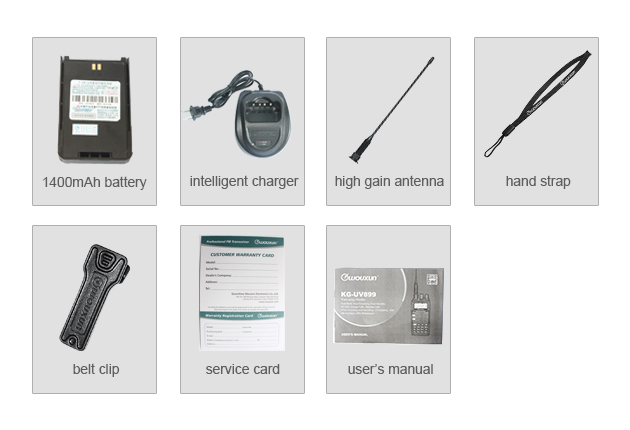 Over the competition, the Wouxun KG-UV899 offers the following. A full 4W of output power. NOT MAKE YOU SEND THE RADIO BACK TO CHINA.